Young Adolf as you have never seen him before… Experience Adolf Hitler’s childhood in striking detail. Witness his ordeals, from the rigors of his schooling to beatings by his father. Factual accounts are interspersed with fictional inventions, such as his relationship with a hypothetical girl named Helga. 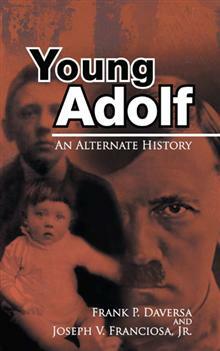 Can young Adolf conquer the personal barriers his difficult childhood presented and become close with her emotionally? How will that change him? Learn more about Adolf the boy. Experience the molding of his dreams, his prejudices, and his desires in visceral detail. Come to understand the inner-workings of History’s most infamous megalomaniac through the perspective of a child’s eyes. Follow Adolf from birth to his late teenage years. Know the boy before he was the world’s most feared man. Witness his courtship with good-natured Helga. Follow their relationship as it grows. Then decide for yourself if Helga’s influence might have altered the course of History.